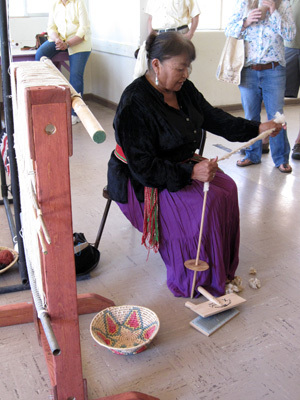 Crossing Worlds Hopi Projects takes an active role in inviting Hopi artists and cultural presenters to our Verde Valley Archaeology Center Fair March and April events. We helped support the participation of 30 Hopis at our first fair who brought with them the authentic sense of Hopi life and thought. The Hopi presence brought a depth of cultural experience for fair visitors and generated a lot of energy, interest and enthusuiasm. Photo to right is of youngest member of the Yellow Fox Hopi dance group we have supported in coming to our Verde Valley Archaeology Society events. He had noticably matured since coming in the spring and really paid a lot of attention to all the details and was very proud to be up on the stage with his family. Heart warming to see! Other Hopi participants commented to me that they felt like they had a chance to be heard that is hard to do on their remote reservation. And that they enjoyed interacting with our visitors at the festival. We have also helped sponsor bringing representatives from Natwani, the traditional farming education group. A young family Sandra encouraged to come to the March, 2012 festival, for example, had hardly ever been off of Hopi–this was a major experience for them. Charles and Doris West hosted the young family, even gave them rides from Hopi and back to Flagstaff. Please see images and report here. Immerse yourself in Native American culture and the archaeology of the Verde Valley of Central Arizona. The Verde Valley Archaeology Center hosts two main events each year. The Verde Valley Archaeology Fair is held annually during Arizona Archaeology Awareness Month in the 3rd weekend in March. The Fair features archarology exhibits, demonstrations, a “archaeology for kids” area, and an International Archaeology Film Festival featuring archaeology documentaries from around the world. The Fair also includes an American Indian Art Show. The Verde Valley Archaeology Center recognizes the American Indian heritage of the Verde Valley with an annual Festival of American Indian Art for artists from throughout Arizona and the Southwest. The event promotes greater public appreciation and understanding of American Indian artistry, encourages artistic achievement in a variety of media and establishes a stronger market for American Indian art. The annual Festival of Native American Film and American Indian Art Show is held in the Fall, the last weekend of September at the Camp Verde Community Center, Camp Verde, Arizona. The Native American Film Festival provides a venue for feature films, shorts, videos and documentaries of USA American Indian and Canada First Nation communities. We often include feature films by indigenous people of other countries. Public screenings and events will be held for two days. A young Hopi girl who loved the face painting plus she got to go to a hike to one of her ancestral prehistoric sites in the area.